Steph's Snack Shack: Mmmm. That sounds good. I'll have that. Normally, it takes me anywhere from a few months to a few years before I put a recipe up on my blog, but this dish is so good I literally just finished eating and had to blog about it now. For us, this was a great Sunday dinner because not only is it delicious, but it's incredibility easy and quick to make. With the exception of the shrimp and bread we had all of the ingredients already in the house. Melt the butter in a cast iron skillet over medium high heat. Add the remaining ingredients, besides the shrimp and bread, and bring to a simmer. 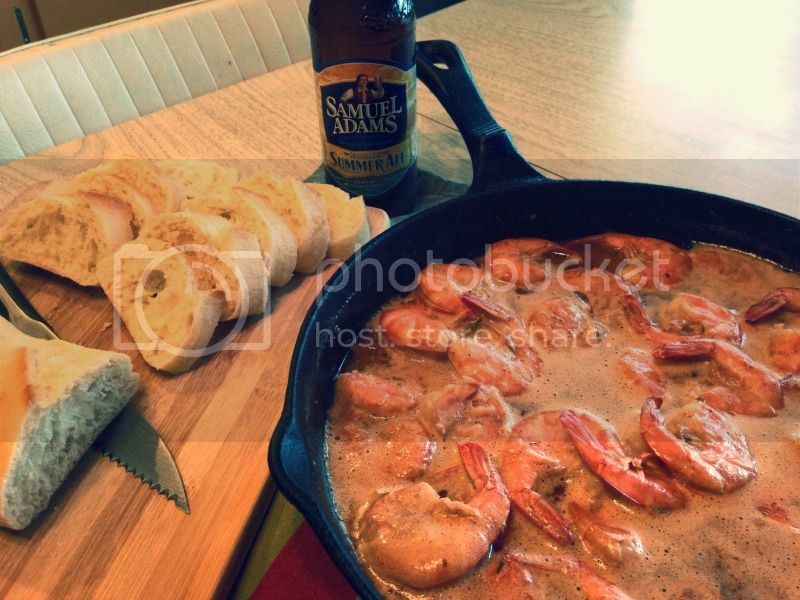 Serve shrimp in the sauce and sliced bread on the side. The sauce is the best part. I was surprised that it had a couple layers of flavor. You taste the beer first and then you get a little bit of heat in the back of your throat. It seems logical to have a beer with this dish, but I was so full I think a beer would be too much. I'd recommend having with a glass of iced tea. YUMMMMMY! I have to try this! Did you buy the shrimp already deveined? Yeah, we were able to buy the shrimp uncooked, deveined, and with the shell on.